Published Feb 17, 2016 by Pearson IT Certification. Part of the LiveLessons series. More than 7 hours of training so you can pass Red Hat Certified System Administrator (RHCSA) in Red Hat OpenStack exam. Red Hat Certified System Administrator (RHCSA) in Red Hat OpenStack LiveLessons is a unique video product that provides a solid understanding of OpenStack in a Red Hat environment. Not only does it provide all the information that is needed to pass the Red Hat Certified System Administrator (RHCSA) in Red Hat OpenStack exam, it also provides in-depth insight and knowledge about OpenStack to help IT Administrators, designers, and architects get practical knowledge on how to implement OpenStack based cloud solutions. 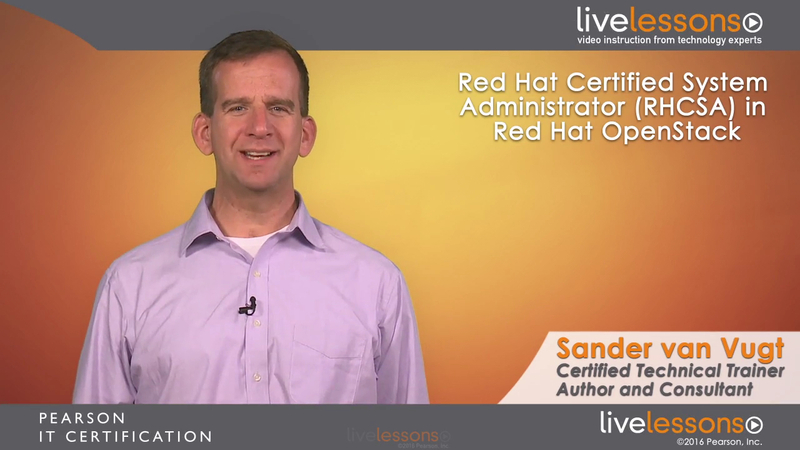 Red Hat Certified System Administrator (RHCSA) in Red Hat OpenStack LiveLessons contains 14 individual videos lessons, for a total of more than 7 hours of instruction. The videos consist of audio instruction, whiteboard teaching, live CLI demos, and video screen casts. Every objective in the exam is covered. The ideal target student has some preliminary Linux knowledge already. Pearson’s LiveLessons video training series publishes the industry’s leading video tutorials for IT pros, developers, sys admins, devops, network engineers, and certification candidates. LiveLessons feature the highest-quality professional skills training led by recognized author instructors published by Addison-Wesley, Cisco Press, Pearson IT Certification, Prentice Hall, Sams, and Que. Topics include: IT certification, programming, development, networking, software skills for the home, office, and business, and more. Your purchase provides you with lifetime online access to the content. 10.1 The Big Picture: Where are we Now?